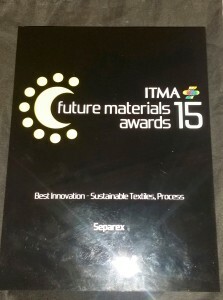 Champigneulles, France: – Specialist contract development and manufacturing organization (CDMO) SEPAREX has triumphed at the ITMA Future Material Awards 2015, gaining the Sustainable Textiles Process prize for its revolutionary DeDye process. 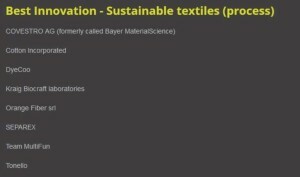 SEPAREX was one of eight companies shortlisted for the Best Innovation – Sustainable textiles (Process) category in the ITMA awards, a highlight of the landmark ITMA 2015 Expo in Milan, renowned as the ‘Olympics of the Textile Industry’. The French company, part of the FeyeCon Group, was nominated for its breakthrough DeDye process that uses supercritical fluid chromatography (SFC) technology to achieve waterless de-dyeing and recycling of synthetic and polyester-based textiles. The awards were announced at the gala dinner at the Marriott Hotel, Milan, on November 16, the fourth day of the expo. Managing Director, Dr. Audrey Ngomsik-Fanselow and R&D Coordinator, Dr. Audrey Common, accepted the award for SEPAREX. This was also SEPAREX’s first attendance at the ITMA Expo, where the French company received many enquiries about DeDye product and its other SFC-based decolorization and recycling processes. “This is an immense honor for our company, achieved against really formidable competition,” said Dr. Ngomsik-Fanselow. 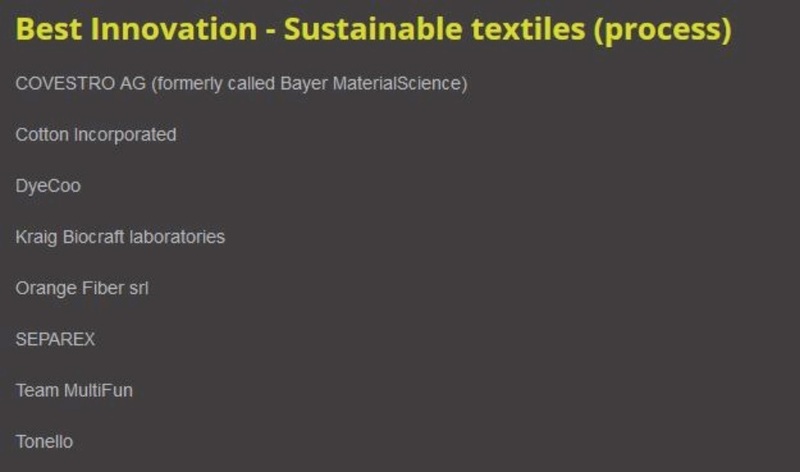 “Being recognised as the most innovative technology by a jury of industrial experts, is also a very proud moment for all of us who have worked on the DeDye process to decolorize waste polyester textile without impeding the quality of the fibers, allowing them to be recycled more profitably,” she added. The new process had already gained significant attention in the industry, being featured in recent articles in Ecotextile News and Roads to Innovation. SCF extraction, fractionation, micronization, purification, sterilization, encapsulation and other technologies based on high pressure applications of supercritical CO2 provide non-polluting “tunable” solvents with intermediate properties between liquid and gas that make them highly efficient as reaction media. SEPAREX also builds and installs production equipment for many different application fields in the pharma, bioscience and fine chemicals industries, including SCF reaction, solid batch extraction and liquid fractionation plants, Aerogel production machinery, and oxidization reactors. The International Textile Machinery Association (ITMA) Future Materials Awards are a centrepiece of the ITMA expo, considered the ‘Olympics’ of textile machinery exhibitions. The show is held every four years in Europe. Since its inception in 1951, ITMA has been a catalyst for change and competitiveness for the industry. The 2015 awards featured more that 170 shortlisted finalists in 19 award categories. ITMA Expo 2015 was an eight-day event opening November 12 at the Marriott Hotel in Milan. Featuring 19 exhibit sectors, ITMA 2015 will showcase the latest textile technologies, encompassing the whole production chain. The exhibition covered some 200,000 square meters of exhibition space, with over 1,300 exhibitors from 45 countries. More than 100,000 visitors have attended from over 140 countries. ITMA and ITMA Asia are brands owned by the European Committee of Textile Machinery Manufacturers (CEMATEX). ITMA comprises national textile machinery associations from Belgium, France, Germany, Italy, Netherlands, Spain, Sweden, Switzerland and the United Kingdom. 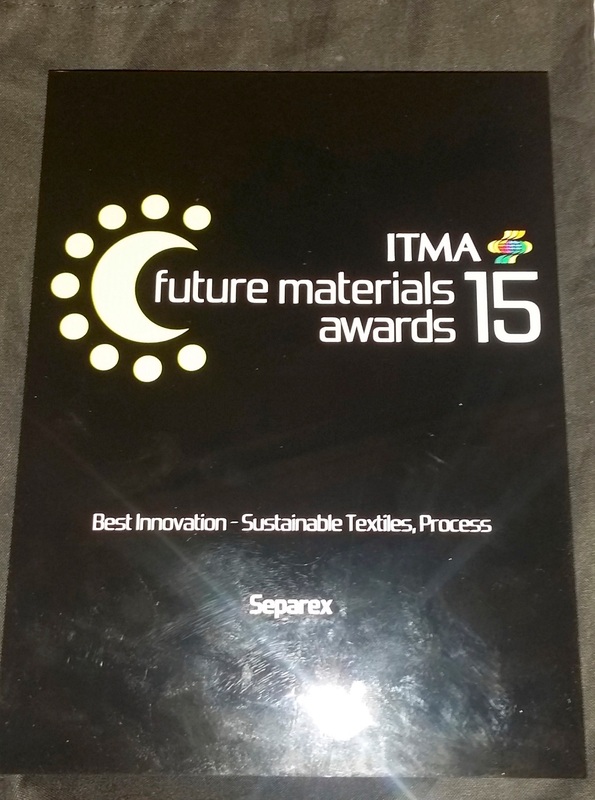 Click on SEPAREX De-Dye process wins ITMA sustainable textiles award for more information.